Click here to see how the Scoop Dryer works. The only thing better than pull-through drying is pull-through drying made easy and affordable. Points of air flow resistance are bad news in any pull-through cotton drying system. 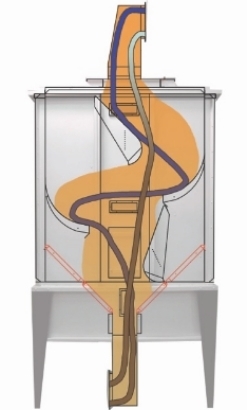 The Scoop Dryer offers a free-flowing path for both hot air and cotton with only one third the air resistance of some typical pull-through dryers. This allows the user to increase his drying power and often increase throughput! Selective drying action inside the Scoop gives wet cotton more hot air action than dry cotton. Installation and design are easy and operation is forgiving with no moving parts to maintain. Try using the Scoop Dryer with heaters that provide large hot air volumes whenever possible. You will notice that performance increases with the increased hot air volume, a popular feature of pull-through drying systems. Your system can improve at the rate that you and your budget are comfortable with. Welcome to the world of pull-through drying. You will never go back. COPYRIGHT © 2000-2019, SAMUEL JACKSON, INC. ALL RIGHTS RESERVED.